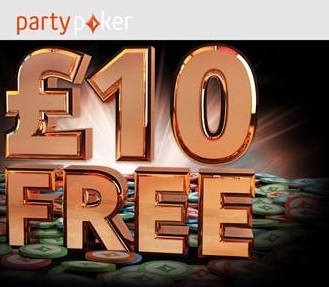 All new UK signups at PartyPoker between now and the end of April 2015 will receive £10 free to play with at casual tables. You’ll receive your free £10 within 48 hours of creating an account. No deposit required. You can deposit later for the normal PartyPoker signup bonus if you decide to continue playing. One account per household is eligible for this promotion. Promotion ends 23:59 GMT April 30th 2015. This free money promo is aimed at recreational players and must be released at $0.10/$0.25 casual tables or lower. PartyPoker recently lowered the monthly requirements to qualify for Silver, Gold and Palladium VIP level, for up to 22.2% instant cash rakeback.